Ready for adventure? Ready for fun? The excitement begins as you slip into your own inflatable kayak, aka “ducky”, and start running the river in your own boat. Kayaks are an amazing adventure for any size family or group. Have the day off or traveling during vacation? Come see us and make your own Colorado kayaking memories this season. Our duckies are open and easily maneuverable and they offer a totally different experience on the river than rafting! Paddling your own watercraft is a great confidence booster for kids and an invigorating free-feeling for adults. Sitting low on the Arkansas River gives you a new vantage point and makes even small waves into big events; it’s a great adventure even with low water! 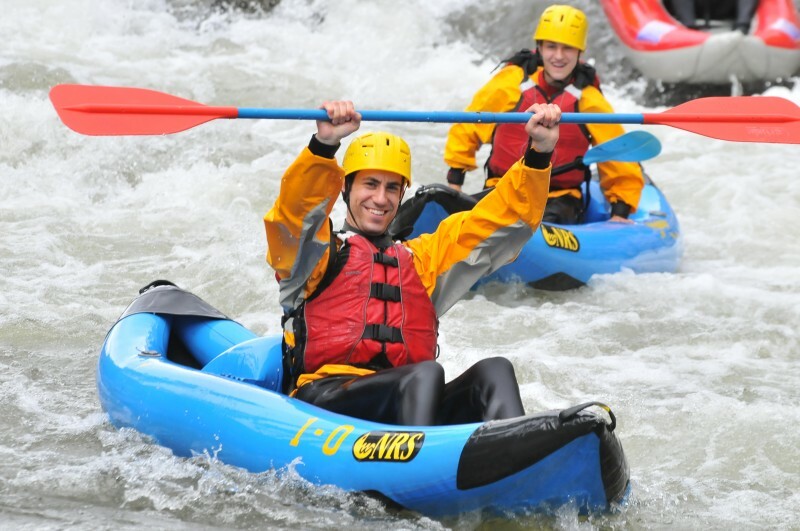 Whether you are out to have a great time with family, hanging with friends, adventuring on your own or team building with work colleagues, kayaking at Browns Canyon Rafting is a totally customizable experience. Paddle to happiness under the instruction of one of our experienced and certified guides. Our guides will show you the ropes and teach you proper kayaking techniques as you learn how to steer yourself through mellow rapids or challenge some of the skills you’ve acquired in the past. We cater to the first timer and the experienced kayaker alike and choose the section of river best suited to each member of your group. Take a morning trip, meeting at 9 am, or an afternoon excursion at 1 pm. A half day trip allows enough time to enjoy hiking and climbing nearby or enjoy a leisurely lunch in Buena Vista! All of our kayaking trips provide everything you need for an unforgettable river adventure: your very own inflatable kayak, paddle, wetsuit, booties, splash jacket, life jacket, and helmet. Tandem kayaks are available, but we highly recommend maneuvering your own vessel. Every trip is guided by an experienced and certified Browns Canyon Rafting guide who will accompany you down river and teach you to steer your way through the rapids. Trips meet at our Buena Vista outpost at 9am & 1pm daily from late April to Labor Day Weekend.